Dr. Dennis Harding has recommended Gua Sha to a select group of his patients for many years. Often these patients suffer from tightness through their shoulders, specifically in the trapezius region. Because the trapezius muscle interacts with the atlas and axis vertebrae, if it is tight, it can pull these out of alignment, affecting Dr. Harding’s careful adjustment of your neck. Robin has performed Gua Sha treatments for Dr. Harding’s patients for more than two years, using a carefully designed protocol that he taught her. She generally uses a tool specifically designed for Gua Sha made from buffalo horn, although stone tools are available if you prefer. A Gua Sha treatment costs $50 and lasts from 30-45 minutes. Your first appointment will last longer as we will take some time to talk and review your medical story. Feel free to google Gua Sha, but don’t be alarmed by the pictures you see. It looks scary, but it’s not! “Gua” literally means scraping. The technique uses the tool to scrape your skin, but most people do not find the process painful, in spite of how the pictures looks. 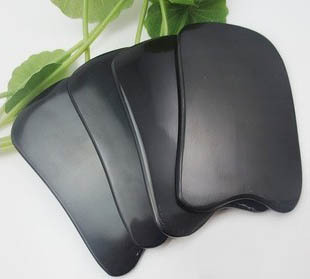 Gua Sha increases circulation to the area where it is applied, aiding in healing and encouraging relaxation. Robin also offers tutorial sessions where she teaches a friend or partner the basic Gua Sha technique, which they can then perform for you at your convenience. 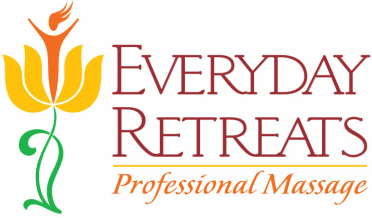 These teaching sessions cost $80 and include a buffalo horn tool, an instruction sheet, and a small bottle of massage lotion. Robin accepts personal checks and credit cards. Before your session: Try to be well-hydrated. We recommend that you drink up to half your body weight in ounces of water the day before the session, spread throughout the day, or as much as you are comfortable with. Don’t try to drink it all in one sitting. Good hydration seems to improve the effectiveness of the treatment. Be aware that you will have some red marks on your back following the treatment. These generally last for two to three days, a week at the most. Keep this in mind, just in case you have an upcoming event that requires you to have a bare back: a triathlon, or a fancy dance where you wear a backless gown. You will only need to undress from the waist up. Ladies are given a towel to use as a drape, and only expose their backs. Robin applies massage lotion along the shoulder area and down the spine. You begin by sitting on the edge of the table. About half-way through the session, you will be able to lie face down on the table while Robin completes the treatment along the spine. If you suffer from vertigo, you can remain seated throughout the treatment. Many people find Gua Sha very relaxing! You can also add a 30 minute massage to your gua sha session if you would like. These add-on massages cost $30. Questions? Call or text Robin at 530.830.2677.